ΛMYSΛVIN: God's Not Dead - Propaganda or Art? 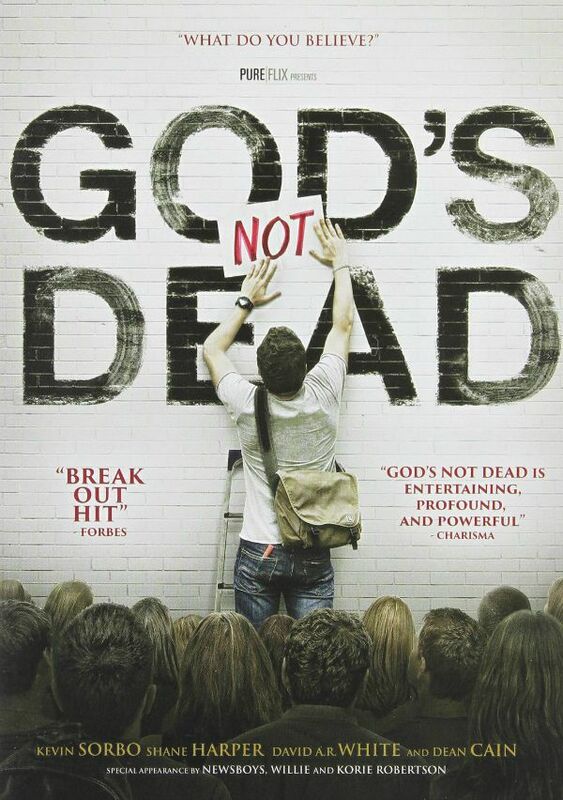 God's Not Dead - Propaganda or Art? Last night I finally watched God's Not Dead. It was on Netflix and I had surprisingly heard some decent things about it from friends, so I thought, why not give it a try. My husband entered onto the scene not long after it started. He initially walked away after a few minutes, however, overhearing the movie from his office he stepped back into the room to stay. He was intrigued. We both were. We were intrigued because we could not believe our eyes and ears. I've known and experienced Christian, low-budget movies before. I was already prepared for the cheese, and to be honest, I can handle cheese, even get moved by it, but it wasn't the cheese that offended me. It was the very nature of the film. The whole movie was dripping with propaganda and insensitivity. As soon as I finished watching the movie, I went online to read reviews to see if I was alone in my impressions of the film. Review after review from Christians, pastors, agnostics alike, all wrote reviews that echoed my heart cry. They were deeply offended. An atheist professor makes his class declare that "God Is Dead" (which is extremely unbelievable, setting the tone for the rest of the film), and the lone Christian student in his class spends the entire film convincing him that God exists. Along the way, our lead character faces obstacles but determined to win over his class and his professor, he pushes on. 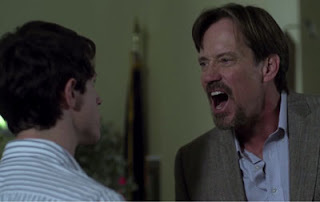 Throughout the movie we are introduced to several side characters, each with their own seemingly unrelated story, who in the end all become loosely tied together in that they attend a Christian rock concert in the movie's final scenes. The atheist Philosophy Professor Radisson taunts our freshman lead character, Josh, for his beliefs and challenges him to prove that God exists in a series of in-class presentations. Josh accepts the challenge, and woven in-between several other stories, are Josh's presentations complete with studio-quality power-point presentation productions. Perhaps Radisson had been baiting his class to see if anyone would rise to the challenge the way Josh does. Maybe Josh, by standing up to Radisson, would turn out to be just the kind of student Radisson was really looking for. Radisson clearly never could have lacked a Christian student in his class before this day, perhaps this was part of his curriculum. I started to look forward to some lively, intellectual debate. Josh's first presentation was about the Big Bang theory and how since scientists don't know how the universe came from nothing, it proves that God exists. I suppose it’s a sign of progress that a movie so popular with evangelicals is okay with the idea that the universe is billions of years old. Josh finishes his presentation, Radisson offers a ridiculous rebuttal and class is dismissed. This is where the movie comes completely off it's hinges. After Josh’s first in-class presentation, Radisson catches him in the hall, grabs him aggressively from behind, and makes various angry threats if Josh dares to go on “humiliating” him in front of the class. "I simply could not believe that a philosophy professor would expose his insecurities so nakedly to one of his students like that. I couldn't help but laugh despite the obvious attempt at creating a menacing tone. It was a shocking scene but for all the wrong reasons. Radisson's behavior sets a pattern that we start to see a myriad of random characters start to follow." Josh has two more presentations to make and when he does, Radisson never offers any of the obvious rebuttals to some of Josh’s typical first-year arguments. This is frustrating because the movie misses out on debating Christianity against points that an actual atheist would make. Instead we are presented with several straw man fallacies that attempt to present the Christian's perspective as obvious and the supposed atheist's perspective as foolish. In the third and final in-class presentation, Josh suddenly exhibits a confidence that he never had before, and he decides to get Radisson riled up in a way that will force him to blow his temper in front of the class. It is in this scene that it is revealed that Radisson is in-fact not an atheist at all, but rather a former Christian who lost his faith due to his mother dying. "An atheist does not carry the debate if the Christian God is alive or dead; ... To suppose that the atheist believes that there was a god, alive, dead or just really drunk is just insulting. If you're going to try to offend atheists, please be semi-accurate in representing the MAIN character as one rather than falsely labeling your own 'brother' as one. I love a good propaganda movie like any other good 'Murican but come on." And note, here, that Josh wins the argument not through logic, but by swaying the class and its perception of their teacher, emotionally. Radisson is wrong not because he has worse arguments, but because he has messed-up motivations for his beliefs. So here we have a film that pretends to be about philosophy, but really has no idea what philosophy is all about — and it’s being pitched to Christian audiences as some sort of grand statement about the validity of their belief. What it really is of course, is a lot of tribal chest-thumping. And it’s remarkable, in that light, to see how “the tribe” is defined within this film. This 'us vs. them' mentality is thrust upon us throughout the entire movie. It is through this agenda that we see how offensive this movie actually is. All of the "thems", (the people who are non-Christians), all have something in common. And what is that? Lets take a look at some our atheist characters. Professor Raddison: a tyrant in the classroom and in his personal life; he mocks and threatens his students and publicly humiliates his girlfriend. The Journalist: a career-driven and rude woman; ambushes her Christian interview subjects (Duck Dynasty’s Willie Robertson and his wife Korie in one encounter, and the band Newsboys, in another) to ask them offensive questions. For example, she asks, “Why aren’t you barefoot and pregnant?” in the first interview. The Businessman: portrayed as the most self-centered and callous person imaginable. He does not visit his mother because she is suffering from dementia, and he breaks up with his girlfriend when she reveals she is suffering from a fatal cancer. The Abusive muslim father (Need I say more), but I will later. Father of Chinese student: shows no interest in his son’s life, and when his son starts talking about God, he gets angry and shuts him down. "The Character portrayals of atheists and other religions will generally be found to be unbelievable by viewers, whether Christian or not. And worse still, for a professing Christian movie to portray them so unreasonably is very uncharitable. Weaker brethren may even find these portrayals believable and if so, it will do nothing to engender Christian love to those who are outside of Christ. We (Christians) do not like to be caricatured in this way, and certainly believers should apply the admonition to “do unto others”. 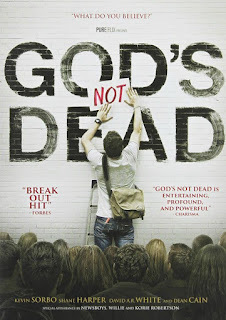 God's Not Dead acts like a huge warning for Christians; a "look out! ", or "beware!" of these types of people that will get in your way or come against you. In one completely out-of-place scene, we see reality TV star Willie Robertson from Duck Dynasty walk into church with his wife. They are both ambushed by a the atheist journalist who wants to interview the TV star and ridicule him for his beliefs and support of guns. Willie Robertson defend's himself against this liberal by sporting his American flag bandana and quoting scripture. “God’s Not Dead” wants us to know that Christianity is under attack in the old U.S. of A. — attack from the liberal, “Duck Dynasty”-hating media ...."
When Josh's girlfriend dumps him after 6 years (they were dating since they were 12), the movie is suggesting, "Beware of that non-supportive Christian". Through the character of Raddison who verbally abuses his students and his Christian live-in girlfriend, we see "Beware of the world of academia, with its self-important evolutionary scientists and atheistic philosophies." And perhaps the most offensive "beware" in this film, is the "Beware of non-Christian faiths"
The portrayal of the one and only muslim family was by far the most offensive aspect of this film, at least to me anyways. Ayisha, an attractive girl who while waiting to be picked up from school, puts on not just a head-covering, but a face-covering right before her ride home arrives to satisfy her father. Here we have the conservative Muslim father who is oppressing his daughter who just wants to be a Christian and wear "normal" clothes. It isn't long before her Muslim father finds out that she has been listening to Franklin Graham's sermons and begins to beat her, all while a Christian radio pop song plays in the background as the soundtrack. Perhaps it is ironically fitting that we are treated to an anti-Muslim, abuse scene revolving around the discovery of a sermon by Franklin Graham since he is sadly known for creating fear-mongering against Muslims. Further credibility this movie had as a movie, or a theological thought piece is lost. "This will probably cause any Muslim watching the movie to immediately step out in disgust. Sure, this may happen a lot in other countries and maybe even sometimes in the U.S., but they shouldn't have shown the only Muslim family in the entire movie as being abusive and dysfunctional. That alienates any Muslim in the audience as being dysfunctional." Eventually, all the movie’s various threads - and there are a lot of them, several of which the film doesn’t even try to tie together until maybe an hour into the story - come together at the aforementioned Newsboys concert. And this, it seems, is how the film understands evangelical community: a bunch of people going by themselves to a rock concert, basking collectively in the glow of pop-culture celebrities. If Willie Robertson from the hit reality TV show Duck Dynasty didn't seem like product placement, the Christian radio pop band the "Newsboys" playing themselves will. While we enjoy them performing a couple of their songs, we see Radisson at home reading a letter from his late mother where she spells out her hopes and dreams for him. After he reads this letter he phones his ex-girlfriend (who is currently enjoying the concert). When she doesn't pick up, he notices a newspaper on his desk with the headline detailing that the Newsboys are playing in town. Upon this revelation, he rushes out and starts walking downtown to find her. Radisson crosses the street only to get hit by a car. A pastor we'd been introduced to early in the film, and his African American missionary friend see him get hit, and without ever knowing or meeting this character, instead of screaming for help, getting paramedics, calling 911, (anything at all! ), they begin talking to him about his faith in Jesus. The Reverend says it's a miracle that the professor wasn't killed instantly! Of course, the professor dies anyway so really he ends up dying painfully and slowly, while also being forced to profess faith in Jesus before his death. Maybe it was just poor acting, but there was no compassion, no genuine concern about this man. It was like no one cared about him. The pastor and his friend seemingly laugh light heartedly about how the professor is in heaven right now anyway, like their mission was accomplished. After Radisson closes his eyes, the movie cuts back to the Newsboys concert where one of the Duck Dynasty guys appears on a screen at the concert and tells everyone in the audience to take out their cell phones and spam everyone they know with text messages declaring “God’s not dead.” This, he says, is how “we’re going to tell Jesus we love him.” (And then the film’s closing credits tell people in the theater to go and do likewise.) We are treated to a scene where all the angry atheists (who are still alive) pull out their cell phone and read the text and then go on with their lives. They are impacted about as much as anyone would be after watching this movie. And that is really where this movie's failures come to a head. Even though the movie has a dozen random plot-lines revolving around Josh's collage debates over the existence of God, they don't really make anyone change their minds in any believable way. Josh's arguments, the movie's central focus, have nothing to do with Jesus. He may as well have been arguing for the existence of Allah. The way both Josh and the film as a whole assume that any proof for the existence of God must necessarily constitute proof for the existence of Jesus and the rest of the Christian belief system is laughable. The fact that there are so many religions — the fact that so many people believe in God without subscribing to Christian beliefs about a certain historical person named Jesus — should tip us off to the fact that there is an entirely separate discussion to be had there, beyond abstract arguments for and against the existence of a Creator. Instead we are left with Josh winning over his entire class. Each student, one by one, comically stands up and proclaims "God's not dead" in a robotic fashion. Was there a Muslim in the class? Maybe Josh was making a case for Allah. Maybe that is why some of them stood up. Who knows, because otherwise their conversion via three twenty minute presentations certainly couldn't have accomplished that. "In actually, atheists do not "hate" god; god is simply something they don't believe exists. As to forcing their way of thinking on anyone, the movie has it backwards. It's Christian zealots who demand that everyone think like them. Most atheists - those that I know anyway - are happy to let others believe as they wish as long as they don't force their "values" on the rest of us." I'm not trying to bash the writers or producers of this film or sound cynical. I think us Christ-followers can have meaningful discussions, raise valid questions and should think critically. That's my goal with this post, not to bash, but to ask thought provoking questions. We need to provoke each other to good works (Heb. 10), and I am concerned that some Christians are unable to see how divisive films like this can be, even if the intentions were good, or to be a "witness". If Christians are going to continue to make movies about their faith, they need to reflect the love of Jesus Christ. A non-Christian should be able to watch it and feel attracted to something holy and unexplainable. If Christians make movies that are self-serving, negative, xenophobic, and demeaning to non-Christians then they are doing much more harm than good. “Although [this film] may offer Christians some apologetic material, it will fail to engage the larger culture in any meaningful way. The reason for this is simple. Most Christians seem wholly unable to grasp the difference between propaganda and art. Art is a powerful but subtle tool that draws people in and causes them to question their assumptions without even realizing it . Propaganda is a blunt force instrument for communicating dogma in story form. Without any shadow of a doubt this film is more propaganda than art, and thoughtful atheists will see it for what it is even if Christians can’t. Perhaps we need fewer Christians doing art and more artists serving Christ..."
i appreciate and value your assessment of this movie...and in fact...woke me up...thank you!..